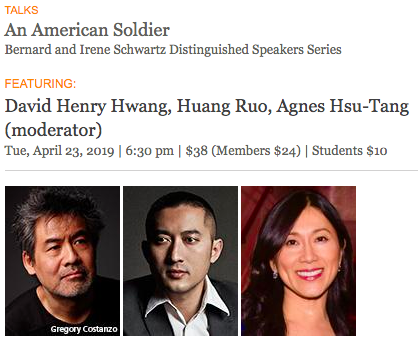 An American Soldier is a grand opera based on the tragic life of a 19-year-old Chinese American soldier Danny Chen, whose death while serving in Afghanistan led to President Obama signing into law a bill designated to combat military hazing. In this intimate conversation, composer Huang Ruo and librettist David Henry Hwang explore their highly acclaimed work that was hailed by the New York Times as among the Best Classical Music of 2018. Exclusively for New-York Historical, this special event will include a performance of excerpts from the opera. Huang Ruo is an award-winning composer and conductor whose works have premiered and been performed by the New York Philharmonic, Philadelphia Orchestra, Santa Fe Opera, and others. Acclaimed playwright David Henry Hwang has received numerous honors for his prolific work in theater, television, film, and opera. His M. Butterfly won the Tony Award for Best Play and was a finalist for the Pulitzer Prize for Drama. Agnes Hsu-Tang (moderator) is an international cultural heritage policy advisor on the faculty at Columbia, a managing director at the Met Opera, and a trustee of the New-York Historical Society. Use code: AS419 for $10 admission ticket. No user commented in " An American Soldier "